You imply what with that statement? And how will you prove that? Those from Dr. Who? Please. Ok. In that case try - Seraphs - like the fallen seraph named Ananel. He once verified that the information from a fallen Watcher named - shem + ya'ah + aza "of the Name of power" was true. Too bee honest - i believe many of the fallen angels are so damn weak that their wings are naturally very faint - as depicted by the Draconian race where their wings almost do not even exist. 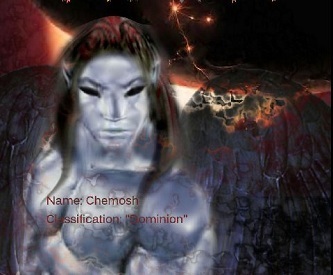 Or are so faint in the pictures of the DOMINION angels race, that it explains why they are programed to fail. Note: Here is the challenge: If this spastic failure has any strength, then allow Yahushua to pull back all His protection and allow this Lucifer GRUNT to destroy me. Hmmmm, see you in a week as nothing will happen - as expected. We All have destined paths to OBEY. i am going back (AGAIN) to Totnes to see a close friend with 2 bottles of £14 Aldi Vodka to follow destined paths as GOD wanted us to follow. The fallen angels are just sitting by having a good laugh at our actions before this world goes SH1T. Sometimes i wonder, what is the point of repeating the same Elohim info on ATS if no other mortal human can handle it ? Maybe Rephaim info is destined for Repahim only. Ok - try this. Every mortal is capable of this. Lets say you have a dream (OBE) event that is so damn horrific that you believe that you have descended to hell. You post the vision on the Internet and leave it at that. A Internet ID comes along and says "your vision of Revelation 16:10" when the sky goes "Freeking" black; that is Tartarus. Well it is not Biblical revelation - But Hell it self. Here is the FACT: GOD has made us all equal. The question is: who is willing to allow their soul to be taken to new levels that they never thought possible: AND once they reach that level: They =can NEVER allow Pride to intervene into their lives ever again. To me that's just another story. One with plenty details, very few scattered evidence and a history of power. But god means something different to everybody. Correct? So much so the label god means just "unknown". So much so the label god means just "unknown"
When one mets their ultimate destiny - ultimate goal - final path.... GOD is their ONE & Only path back to HIM. That's what I think too. But where does god live? What is he doing with the captured souls? That's what I think to you know. But where does god live? What is he doing with the capture souls? His captured souls are His and His alone: Ready on standby for later use on a far off distant galaxy where their deepest desires will become reality. They are on Stand-By. Okay. Lets take events that are occurring on this very dark world as they are right now, seeing that I am really smashed on Vodka. Everything happens for a reason - and a persons spirit is ready for HIM when He knows READY. So KNOW is the time for many. Are they ready to have their souls upgraded or not. The Real creator exists beyond this current expanding Universe as He alone created It. Hence He is outside the UNIVERSE system. Are YOU Willing to be upgraded by GOD or Lucifuhrer (Hitler) ? Take you pick ! I have put both - Yahushua & lucifurhere on equal levels - hence Battle-ground. Hence: Which part do you pick ! I Choose rebel Rapha / Yahushua/ Love with Banshee option. What about you ?